Multiple VELUX roof windows create gorgeous light-filled rooms and the amazing feeling of being outside. By combining VELUX roof windows you can add a great panoramic view and more natural light – to give your home its own unique character. A larger roof window equals more daylight. Install an additional window element directly below your roof window and see how the daylight, and the view, continues all the way to the floor. Combine your roof window with an additional window element to create an excellent view both when standing and when seated. With the windows stretching all the way to the floor, you open up the view at your feet. 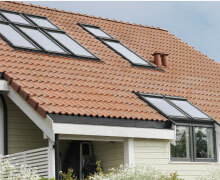 Combine multiple VELUX roof windows to open up your home to more daylight. Choose between electric, solar or manual centre-pivot roof windows or manually operated top-hung roof windows. If the pitch of your roof continues to the floor, you can extend your VELUX roof window by installing an additional window element GIL (clear lacquered pine wood) or GIU (maintenance free) below. These windows have a fixed sash and cannot be opened. Combining a roof window with a GIL/GIU will provide more natural light for your living space. Maintenance free windows (GIU) require no cleaning or repainting but can be cleaned with a soft, damp cloth. 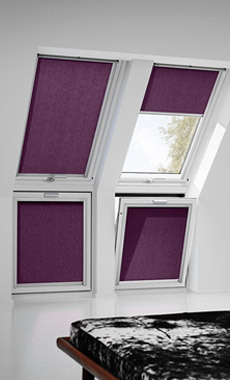 Vertical window elements are designed to be installed directly below your VELUX roof windows. As the windows stretch nearly all the way to the floor they ensure a great view and open up your loft – and your living space. You can choose either a vertical window element VFE (clear or white lacquered pine wood) that opens inwards using a handle on the top sash or a VIU (maintenance free) that cannot be opened. Maintenance-free windows (GIU) require no cleaning or repainting – but can be cleaned with a soft, damp cloth if needed. Let in more daylight by installing two identical VELUX roof windows side by side. A combination of two or more windows is a great way to open up your loft space. Choose between top- or bottom-operated roof windows. Top-operated roof windows have a unique top control bar, making them easy to operate even with furniture placed directly under the window. Bottom-operated (top-hung) roof windows give you an uninterrupted, panoramic view when fully opened. Open up to a world of light by installing two identical VELUX roof windows, one above the other, to create a gorgeous, light-filled room with the feeling of being outside. For ultimate comfort, or if your VELUX roof windows are out-of-reach, the remote-controlled VELUX INTEGRA® roof window is the answer. You can control all your windows and accessories – such as blinds, awning blinds and roller shutters – from anywhere in your house. Four identical VELUX roof windows installed both above and beside each other can do wonders for any room. By flooding the space with natural light, the windows open up your room to create a bright, welcoming place for your family to gather and spend time together. If you want ultimate comfort and your VELUX roof windows are out-of-reach, the remote-controlled VELUX INTEGRA® roof window is the answer. You can control all your windows and accessories – such as blinds, awning blinds and roller shutters – from anywhere in your house.